Many have requested the pattern for the Apple Bloom Quilt, and here it comes. Writing explanations in English is always a bit daunting, but we think you’ll find the necessary information. 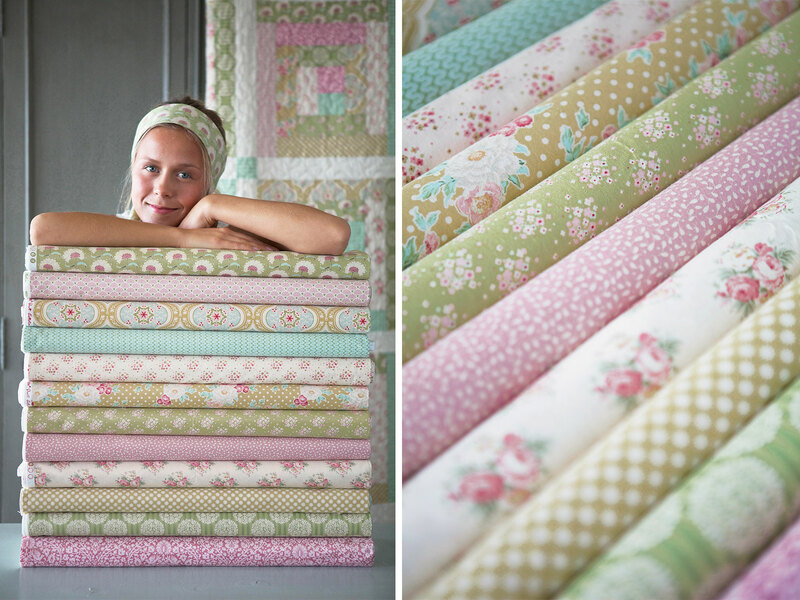 This sweet Apple Bloom Quilt is 58 x 58 Inches (170 x 170 cm) and great for picnics, as a play quilt or a cozy sofa quilt. If you want a bed quilt you can easily add another Log Cabin row or two. Each row will including the border build 16,5 inches (41 cm). 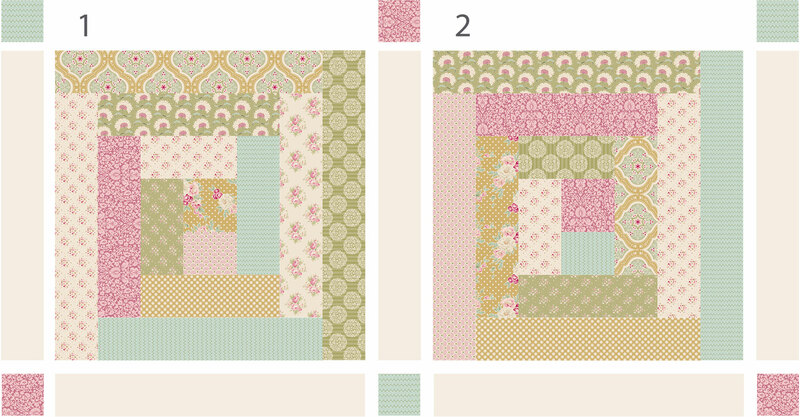 The quilt top is made with 11 of the 12 Apple Bloom fabrics (all except Leaves and Berries Pink), you will also need off-white fabric for the pieces between the Log Cabin blocs. We only pieced the Log Cabin blocks together in two different ways, seen here as block 1 and 2, then made eight of each and repeated them every other time. By using only two blocks the quilt gets a calm rhythm. 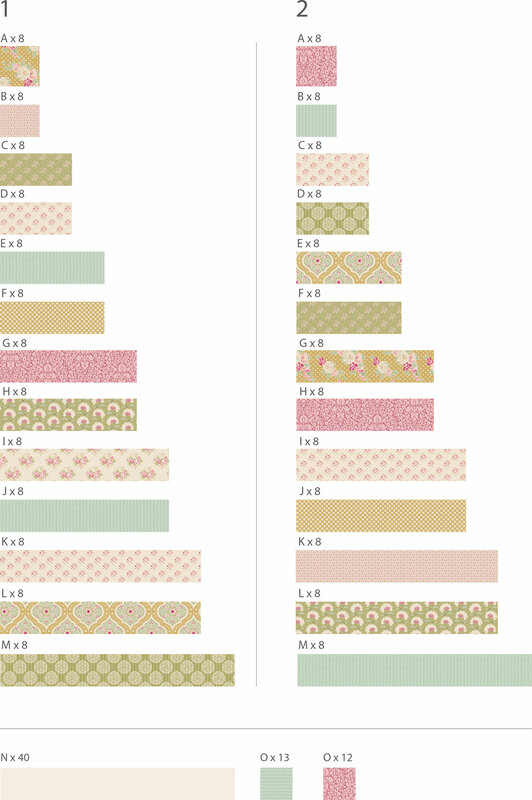 If you want a busier quilt try making 16 different Log Cabin blocks. Here are the measurements for the Log Cabin pieces, the off-white pieces, and the little squares for each corner. The measurements are in inches and you need to add seem allowance. 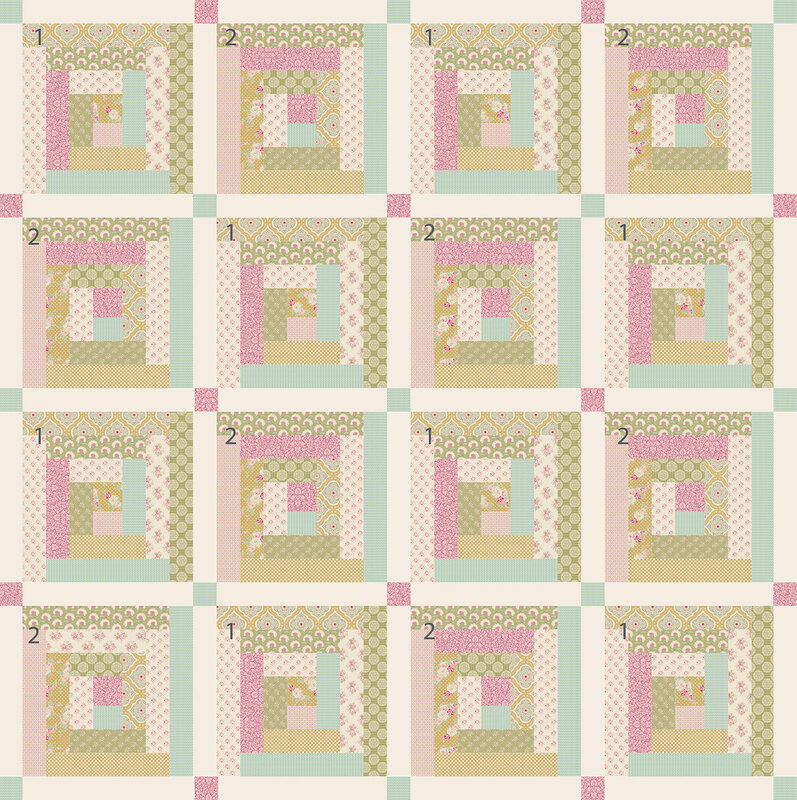 You will need 8 pieces of each size for each of the two Log Cabin blocks, 40 off-white pieces, 13 pink and 12 teal corner squares. This drawing shows how many pieces you need of each size, and witch fabric we have used for the different sized pieces. You recognize the pieces by looking at the letters. “A” is the middle piece on 2,5 x 2,5 inch and so on. You can find many tutorials on how to sew Log Cabin blocks on You Tube. Piece the quilt top together as shown here. The quilting (a medium sized crazy puzzle) is done by a professional quilting service. You will probably find a company that can baste and quilt your larger patchworks near you by searching on the Internet. If you prefer to hand quilt use a basting spray or basting gun to baste the layers together. For the binding we have used “Jean Dove White”.